I believe that my time in Hong Kong is more about the exploration of space than about the acquisition of things. I identified a plot of land near my apartment today that looked like open space so I went to explore. My walk ended up as an exploration of public and private space. The plot was a hill on the edge of an athletic field that I had seen many times. As you walk up this small hill, you leave the neighborhood behind with its dense apartment buildings and people. To give perspective, this is one view from the top–the green buildings are part of a large government housing estate, then behind those is City University where we live–a row of attached buildings, and then right behind that is Festival Walk Mall, with a large glassed in front with metal at an angle, where my office is located. The top photo shows how it looks from the hill and the bottom one is a close up. When I got to the very top of the hill, I found a family playing games and many other private spaces that are allowed to exist within this public space. People have constructed these spaces with both materials around them but also brought chairs, tables, etc. It was clear that they are left there and not bothered by anyone. In the United States we would not allow such private use of public space. We set very strict boundaries and rules around each sphere. Within the density of Hong Kong, society has allowed a different sense of private and public space to co-exist. >High humidity is nothing new to me. I lived in southern Louisiana at one point and used to say that it was 1000% humidity there. And growing up in the Midwest U.S. we would say that on those incredibly hot, humid days of mid summer, we could hear the corn grow. We can watch the mold grow in front of us in the shower. I now understand why the little cleaning ladies are using soft scrub on the walls of the walking tunnel that goes under the street between the university and the mall, and constantly washing. You can see bugs sweat. They would rather not exert themselves unless you move the damp clothes and expose them. You have a choice when doing the wash. You can use the electric drier and bring more heat into the apartment. Or you hang the wash around the apartment, but it won’t EVER dry. On one of the first humid days, dehumidifiers showed up in the grocery store, labeled as “dry baby” machines. I have a confession. Until I understood what was going on, I kept asking Karis why she was spilling water on the floor in the kitchen! In the morning when I went to the kitchen there were pools of water on the floor. OK–I finally got it when I went outside and found all the tile steps wet. It is so humid that at night when the temperature drops “1” degree, all the moisture comes out of the air and condenses on the cool tile. Signs telling of slippery steps and walks arise out of nowhere. This round did not last long, but it is a warning of what is to come. In the meantime we are experimenting with strategies to keep things cool and deal with the laundry until air conditioning season comes. We put the fan in front of clothes that are hangers, hanging from the ironing board. We sit on the other end of the clothes. The air is cooled as the moisture evaporates out of the clothes. I think June in Michigan sounds VERY GOOD. We had a semi-clear day on Saturday so we headed to “the peak.” This was the first real tourist sight that we visited since coming two months ago. The peak is a high point behind Victoria Harbor on Hong Kong Island. We took the tram up to the top. From there we got a good view of much of Hong Kong. We finally found LOTS of tourists, some postcards, and some very strange ice cream–lychee, brown been, sticky rice, black sesame, green tea, date tamerin, etc. The Western Kowloon District is the open land you see across the harbor. This map shows the extent to which it is undeveloped. And notice the extreme change in density of land use! We attended a cultural event called “Hong Kong Water Works: Memory, Water, Architecture” which was held on the Western Kowloon Water Front Promenade. The multi-media dance performance focused on the intersections of memory, water and architecture and was quite good. The modern art, from gardens to other forms of art were a bit like a very small, rudimentary Grand Rapids ArtPrize. What was most fascinating was Western Kowloon. You can’t easily get there from anywhere because this area of the city is part of a recent reclamation project that involves the reclamation of a total of 340 hectares of land along the West Kowloon waterfront from Yau Ma Tei to Lai Chi Kok at an estimated cost of HK$12.0 billion. At the center of this area is the Kowloon MTR Station. We couldn’t get to this station, but took the subway to the adjacent station and started to walk in the right direction. By Hong Kong standards, there was nobody around–big new MTR station, wide hallways, shining, and no people. Only 10,000 people come through the station each day because of its odd location and it looks like an airport terminal. In fact it is–you can check in for you flight there and then get a shuttle to the airport. Someone point us in the direction of the Kowloon MTR Station and again–huge station, connected to a huge mall with wide spaces and few people. Luckily I had printed up the flier so that I asked at several desks about the event and they first looked puzzled, examined the flier, and then pointed in a general direction. Leaving the Kowloon station, we walked out onto an open piece of land that had not been developed–on one side cranes were set up. Karis said it looked like the movie “Walli.” Ahead of us was just scrub land. Behind us was a surreal view that made us feel like we had just walked into a futuristic science fiction film. Out of the scrub land this shining, modern, futuristic development arose. It arose out of this flat, vacant, unpopulated area where we stood. It was an extension of this sense of lack of place and the strangeness of it all was intensified by the fact that the entire area has been recently reclaimed from the ocean. >To end our Chinese New Year celebration, we share this video that Karis took of a lion dance. >I went to my first choir rehearsal last night with the City University staff choir. Let me first describe a theory I heard over the weekend. A business man told me that the explanation he had heard for why Hong Kong employees were not very creative, but just good at very regimented tasks was as follows: Cantonese has 9 tones and so when children are learning to speak they are corrected–you cannot be flexible. There is a right and wrong “tone” and it is very precise. This has led to black and white thinkers. I am leary of that explanation. Back to choir. The choir rehearsal was generally in English. The director, originally from Taiwan, understands Cantonese, but does not speak it well. English is thus the medium. Everyone else spoke English and Cantonese, except me who only spoke English. The first song we worked on was in English–no problem for anyone. The second song was in Chinese. A short discussion ensued as to whether is should be sung in Cantonese or Manderin (the writing being the same). They quickly agreed on Manderin (a more beautiful language) and moved on to sorting out how to say and sing each of the words. Someone took my music and wrote down the Pinyin version of Manderin for me for the first verse so I could make sense of the sounds. This was a Cantonese speaker who could tanslate into Manderin and then use their roman alphabet system to write it out for me. Would you call this inflexible and black and white thinking? After singing through the song several times, I finally remembered to ask what in the world the song was about–honoring and loving your mother. Mmmmm. When I got home that evening and told Karis about this she was quite leary of my information. She thought I had made it up to get some attention. I had nothing I could use to prove it. Several people near the end of rehearsal pointed out the good news–the other Chinese song that we will practice next week has mainly one character for the altos–and that character is sung as “la, la, la, la, la.” I can do that, but don’t ask me to write it out in Chinese. 1. When residents are asked how they feel about where they live, the immediately jump to the national level and interept the question as being about living in the U.S.
2. When different residents were asked to draw maps of the neighborhood, an elderly resident illustrated the pattern among that population–no clear cut boundary line and place names tended to be in Chinese but generic–sports center, convenience store, etc. She also describes a fascinating problem related to the requirement that signage within China town include Chinese signs. When a grammatically incorrect sign was proposed, the younger Chinese residents did not recognize that is was not correct. The older residents did not speak up but grumbled among themselves. Also, there is always the complexity of what the sign should say–describe what is sold in the establishment rather than the actual “name”? (household goods, for example), use Chinese more as a decorative design element, or use a clever transliteration? (Subway uses Saibaiwei which means “better than a hundred delicacies”). In an area that is becoming gentrified, this is an interesting case study–what is the meaning of the Chinese text–is it to create some “image” or does it reflect the true nature of the neighborhood? This case study reminds me of the questions associated with “Dutchifying” Pella, Iowa with everything from windmills to a canal. What is the real significance and meaning of this to the residents? Or does it eventually come down to what outsiders want to see–some quaint vision of what they think it there? Lou, Jackie J. (Forthcoming) Chinese on the side: The marginalization of Chinese in the linguistic and social landscapes of Washington, DC Chinatown. In Linguistic Landscape in the City. Edited by Elana Shohamy, Eli Ben-Rafael, and Monica Barni. Clevedon; Buffalo, New York: Multilingual Matters. Jia Jackie Lou. “Revitalizing Chinatown Into a Heterotopia: A Geosemiotic Analysis of Shop Signs in Washington, D.C.’s Chinatown. Space and Culture, 2007, 10:170-194. The rule is–you may only build above the stairwell–an illegal structure? I joined a Harvard hike on Sunday. We started at the village of Shek Kong and walked 17 k through Tai Lam Country Park. This is up in the New Territories near the People’s Republic. It was a beautiful day with interesting people. Most are in business-related fields and live on HK island, but reflected diverse ethnic backgrounds–Chinese, Chinese-American, French, Philipinno, and European-American. This was the most rural place I’ve been since being here. We started at a Chinese military outpost, oversaw a valley that is now mainly scrap metal business, went through the village of Ho Pui and saw some traditional housing, the local school, ancestral halls, and graves. We followed the contours of the Tai Lam Chung Reservoir. Many of these reservoirs were built in the 50s and 60s, but are not used anymore for drinking water–it sounds like they are back up. We passed through two prisons to get back to a bus stop. This weekend we had two invitations to homes for Chinese New Year dinners. It is always interesting to see the different types of apartments. On Friday night we went to the home of Geraldine and Wallace. Geraldine works with me at the university as a staff support person and her husband is in some computer-related work. They lost their younger son in an accident on vacation 2 years ago while in Thailand. This has drawn them to a much more serious Christian faith. Wallace had books including John Calvin’s theology, all in Chinese. They live in CityU housing. On Saturday lunch we were invited over to the house of an older Chinese couple who I have gotten to know through Christian non-profit networks. Ted and Winnie live in an apartment just up the street from where we live. They invited several other non-Chinese over as well. We enjoyed the great humor of the household, explanations related to Chinese New Year, and another Lion Dance. 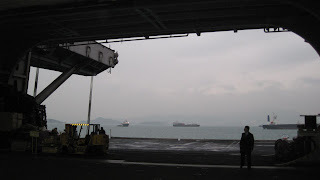 Looking toward Kowloon side of harbor and its lower densities. 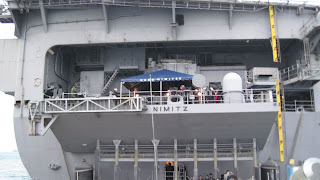 The aircraft carrier Nimitz came to Hong Kong and another Fulbrighter received an invitation to attend a reception on board. He invited me to go along. 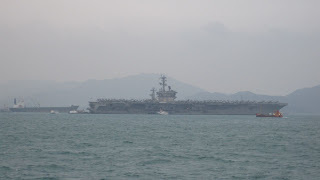 We left on boats from the HK Island harbor and it took about 30 minutes to get to the aircraft carrier. 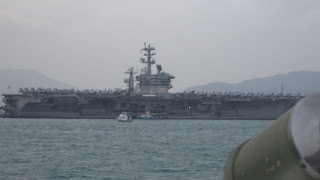 The view from the boat and carrier were incredible. We speculated on who got invited to such an upscale event–it was definitely dress-up. It was business leaders, consulate people, etc. The next day in the newspaper we read that the Chinese had snubbed the event because the US had just sold weapons to Taiwan. 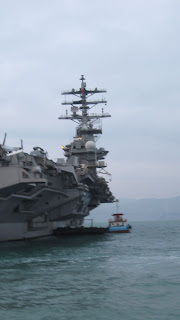 Yet the article pointed out that the Chinese had allowed the fleet to come to Hong Kong. That has not always been the case.